As you were contracted out you should have been paying into a company or private pension, that pension should easily more than make up the difference. That was the reason to decide to contract out, I decided not to when offered the option. Yes, I paid into 2 company pensions, one of which is frozen until I’m 65 and the other I am drawing. I am also paying AVC’s to cover a period when I was working without a pension. 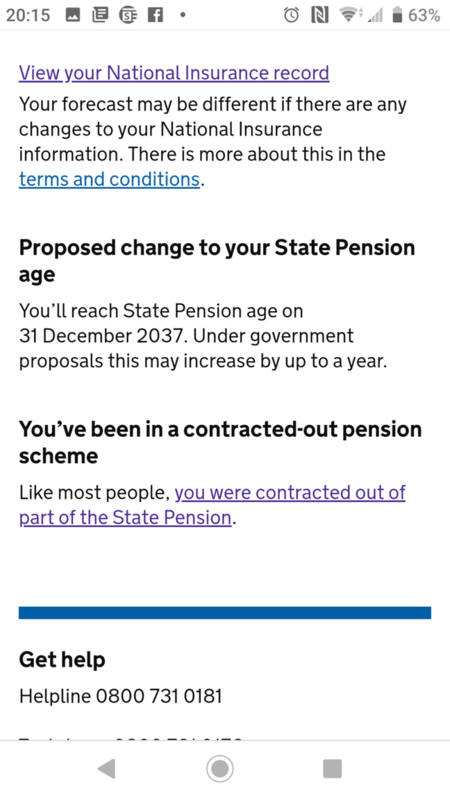 Try to Google `Topping up your state pension`a PDF from Royal London, a company run by former pensions minister Steve Webb. This doc is very useful. I then bought some NI vol contribution years at around 700 pounds a year, which increases your state pension by about 240 pounds a year. An investment that will pay for itself in just 3 years! For anyone who already has 10 or more years but less than the 35 years of complete NI contributions, it could be very worthwhile. All I can say is things are very different now, I thought the only you could get extra was to delay your pension and take it at a later time. Similar situation for me Mike . ( I have 40 years but still need another 6 years) my figures are very similar to yours. I think it means you were contracted out at some point. Thanks Andrew, good point, I was contracted out for most of my career so it probably is that, I need to speak to them anyway to find out why my 2017/2018 is showing as not fully paid so will check with them then (Mid-March when I'm in the UK). I've already paid 2017/2018 & 2018/2019 so if worse comes to worse will pay for another 4 years and hit the full amount (That's if they don't change the rules again :s). Last Nov I already had my forecast and decided to pay the missing years. Call them up with your NI number and bank details on hand and they will sort it there and then. I paid a years amount ( £740 ) for 17/18 and then a partial amount for the 18/19 to get up to date and now monthly. a) DWP (+44 191 201 3600): My NI contributions are EIGHT YEARS short as a result of contracting out. b) HMRC (+44 191 203 7010): They suggested I download, complete and return their forms NI30 and CF83. My understanding is that some/all of my shortfall will be at the class 2 rate. What a difference (in level of service from DWP/HMRC) a couple of years makes!! Interesting as it reads that the money I spent catching up 2010-2016 may have been wasted as they'd given me a start amount in 2016 which didn't include these & paying them doesn't change anything (Which is a bit of a pisser to say the least). If true that would explain why I'm still 6 years short despite having 35 years contributions as the 6 years AVCs paid between 2010/11 - 2015/16 don't count!!! If you were contracted out it tells you at the bottom of the page on the govt portal. If you click on link it takes you to your COPE figure. My understanding albeit I'm not 100 per sure if this figure needs to be deducted fron your state pension as its contribution is made up from your work pension. 30 years should give you a 30/35 pension excluding any contracted out years adjustment. You were almost certainly contracted out for quite a long time. during that time you will have been paying into a different pension, so made lower pension contributions to the state pension and payed a lower NI rate. If you have a full 35 years of full payments, that is the only way to get more.